There is nothing nicer than a gleaming shiny hardwood floor like the picture on the left. This floor obviously has been not only kept clean, the owners have taken really good care of the floor while they lived there. Consumers can hire hardwood floor cleaning services to help them keep their floors looking pristine, but it is also important to treat your floor with care and respect to keep it nice over the years. Refinishing a hardwood floor is expensive and messy, so the longer you can avoid having to refinish the floor the better. Take care of it and you will not have to worry about refinishing for many years. This is an investment in your home that maintains its value for many years. If you plan to use a service to clean your hardwood floors there are a few things to consider before you hire a company to clean your floors. Aside from the obvious checks that you would do regarding someone coming into your home to deliver services, you need to find out how they plan to clean your hardwood floor. Using the wrong chemicals can certainly do more damage than it cleans leaving you with a bigger problem than what you started with. If you are unsure about what products to use or the cleaners should use, you may want to talk to a hardwood floor sales company. They are going to wan to know what kind of finish is in the floor before they can provide solid advise regarding what to use. Most newer floors come with a finish on the floors to protect them and to make them look great. you do not want to damage this finish in any way. First of all they should plan to vacuum the floor to remove all grit that may be on the floor and any dust particles that may have built up over time. If you try to clean the floor with a mop or a cloth, before vacuuming, there is a high risk that you will grind any grit into the floor and even scratch the finish. Over time this approach will leave your floor looking dull and scratched. In fact it is a good idea to vacuum your floors at least once per week and more often if you feel that there is a lot of dirt and grit that is tracked into your home onto your hardwood floor. You may hire a hardwood floor cleaning service or do this yourself. This is a very important step and must be done properly to avoid any damage to your floors. Basically hardwood floors do not like water and to avoid any damage, always use a damp mop rather than a wet mop to wash your floors. If you do get a few drops or a small puddle of water on the floor, wipe it up immediately. Run the damp mop across the floor several times and then rinse it thoroughly in a pail or in the sink. Plain water is find or you can use a little bit of dish soap that is really diluted. We also suggest that you use a paper towel to dry the floor, however if your mop is only damp , any moisture will dry almost immediately as you are mopping the floor. Do not use any chemical based cleaners, such as pledge and other sprays or chemicals. They can sometimes remove the coating on your floor or leave a dull finish to your floor which is very difficult to remove afterwords. Washing your floor with a damp mop is by far the best approach. The frequency will depend on how much traffic the floor receives and whether you were your shoes in the house. We really recommend that owners of hardwood floors do not walk inside with their shoes, especially if they have been warn outside. They track too much sand and grit into the house and over time this will wear the finish off of the floor. Oil based, wax, polish, or strong ammonia-ted or abrasive cleaners. Steel wool or scouring powder. Wet-mop the floor with soap, water, oil-soap detergent, or any other liquid cleaning material. This could cause swelling, warping, delamination, and joint-line separation, and void the warranty. All of these products can harm your floor. 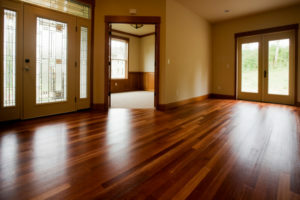 When you interview your cleaner, you will quickly get to know which cleaners know what they are doing when it comes to hardwood floor cleaning and which ones do not. Remember it is your home and your floor. It is always a good idea to stay informed and take charge rather than let someone else make the decision on your behalf. I invested a lot of money in a hardwood floor only to have the cleaning staff make a mess of it. They used some kind of cleaner which left a film on the floor and made it go dull. Cost us thousands to have it all repaired. Always make sure you know what they are going to clean your floor with and show them how you want it done.